Almost iOS users having a question that how can I change iPhone camera resolution Settings? The reasons behind that for each user. To change camera settings for photos or videos for different purpose like the low-resolution picture if you’re low on storage on Phone, or sharing, Printing Photo, Copying or Upload an online form with some size or resolution limitation? Through this article, I give the best tricky option on getting perfect resolution from iPhone camera for shoot photos or videos. Nevertheless, try below all possible solutions and ways for getting perfect picture resolution on iPhone, without edit on Mac or PC. Unfortunately for iOS 9/ iOS 10/ iOS 11/ iOS 12 or above iOS version you can’t change manual camera resolution for photos from settings but works for video. Any iDevice model able to change camera resolution from settings. iPhone 6S/ 6S Plus, iPhone 7/ 7 Plus, iPhone 8/ 8 Plus/ iPhone X / iPhone XS Max/ iPhone XS, and iPhone XR camera settings have options for record camera resolution for video only. Next, Record Video > 4K or other resolution. 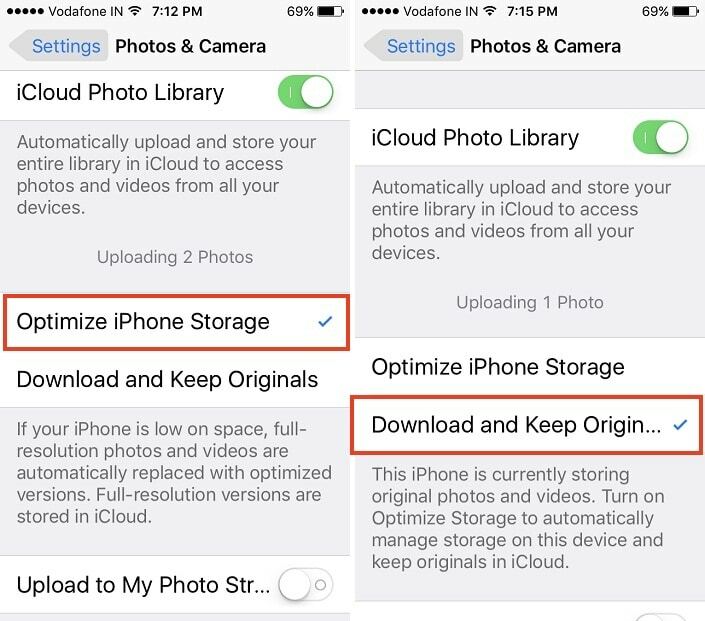 Optimize iPhone storage automatically save the photo in low quality and upload unique photo and video to iCloud. Download & Keep original: Keep all innovative photo and video to iPhone camera app and local access. 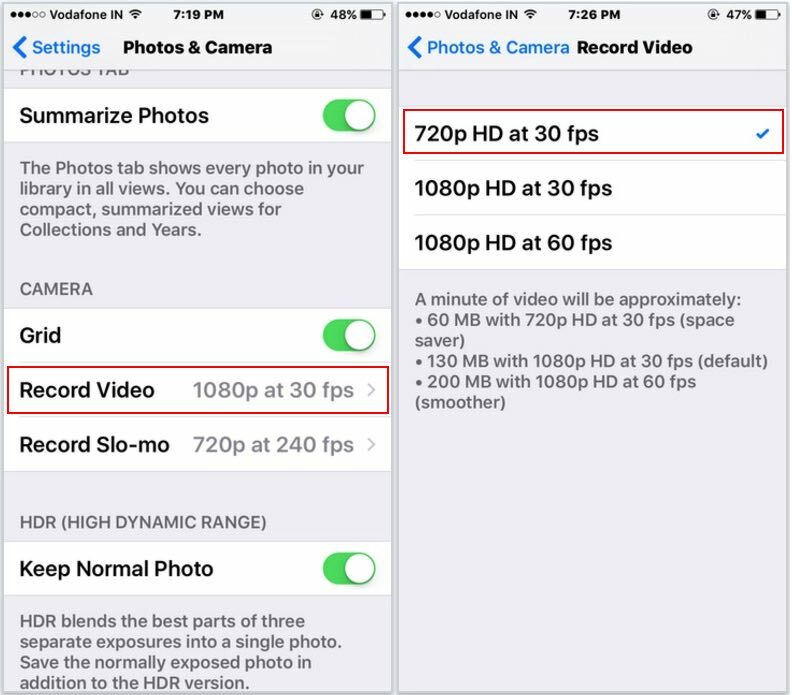 Your Device not eligible to change & record camera resolution, Try 4k iPhone camera apps for video recording. In iOS 11, Apple introduced the Formats function for Camera with two options including High Efficiency and the second is most compatible. Using Formats Settings- iOS 11 Compatible devices user can reduce file size, capture photos, and videos in the high-efficiency HELF/HEVC format. Most Compatible will always use JPEG/H.264. Go to the Settings App – Camera – Formats – choose Most compatible to capture photo format in JPEG. Useful Accessory: Here’s Best Gimbals for Apple iPhone to stabilize video. 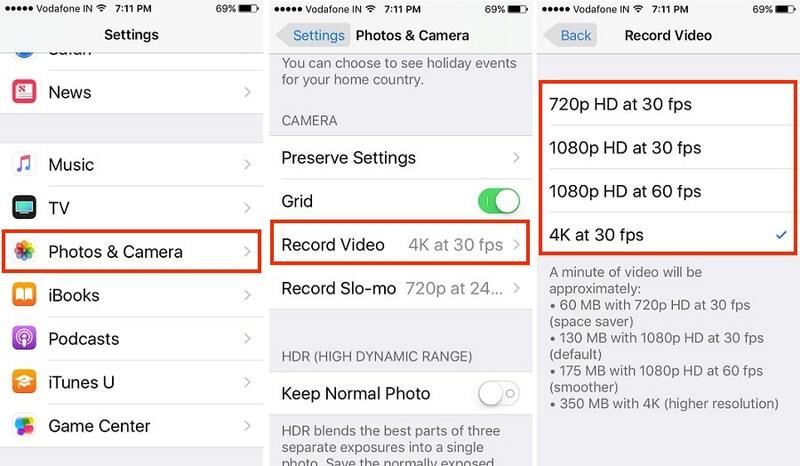 Note: For a change, iPhone video resolution Go to the Settings > Photos & Cameras > Camera Section (Record video or Record Slo motion picture). There you should try for 720 HD, 1080 HD at 30 fps or 1080 HD at 60 fps. Now enjoy video shooting at own resolution. Next for the picture. New iPhone 6S rear camera result is fantastic, No need for more resolution. Still, you want then try pro features app in App Store and also useful for make low-resolution picture saved in iPhone camera roll. New iPhone models and iOS 11 comes with Improved Portrait mode camera result. Image size is the excellent app for move your picture in targeted resolution on inches, pixel, millimeter, centimeter. Then you should be sent to email or save to your iOS device. A Great app for a perfect image resolution maker. iResize also help. proper Photo editing tools work here correctly if you want to resize by crop picture correctly. Another option for change resolution for decrease size of the picture, Open photo from photos app and take screen snap by press home and sleep/ Wake button at once. Your screenshot size is a too low comparatively original photo, that was saved in your photos app. In many cases, a user would like to take a lower resolution photo with your iPhone – for that, you will have to download camera resolution settings app as the best low-resolution camera App from the App Store. You should have an Apple ID and password for log-in to the App Store. An iPhone XS Max, iPhone XS, iPhone XR, and iPhone X user can download the app using Face ID, while other iPhone users can do using Touch ID. Right now above tricks works, because we have no option for change iPhone camera resolution. Please share in the comments.